Examples of NEW PARADIGM Splitting and Pairing Accelerated MASSLESS (Micro) Black Holes. 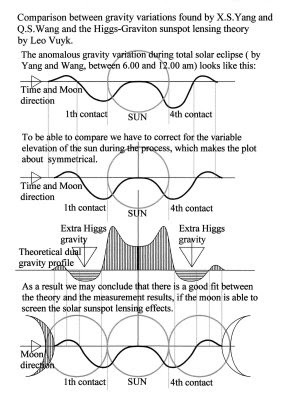 : New gravity model: DOUBLE LE SAGE gravity or HIGGS-GRAVITON pushing gravity. 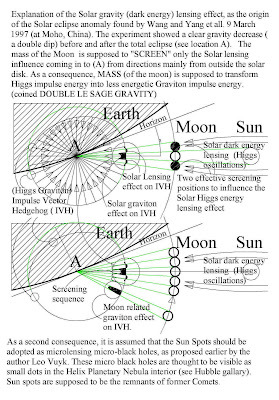 New gravity model: DOUBLE LE SAGE gravity or HIGGS-GRAVITON pushing gravity. Double Le Sage Gravity has two different pushing components (Higgs and Gravitons) both combined in the form of two vector bundles with hedgehog shape or Hedgehog vector bundle manifolds. First we have the oscillating Higgs particles oscillating along the edges of the tetrahedral lattice with the Planck scale, causing the so called Casimir effect and a part of the gravity. All Fermions (so all mass) are radiating gravitons, which are a collision product of Higgs particles with Fermions. The Higgs particle changes form after this collision and travels with the speed of light away from the fermion. Fermions are supposed to have a real FORM, they have a propeller form, able to spin in two directions by the impulses of the Higgs field. Gravitons are assumed to have LESS pushing effect if they collide with Fermions han Higgs particles have. object like the earth is larger than the Higgs–Graviton mixture pressure going out of the Earth. That is why the apple falls. It is assumed that black holes are not able to radiate photons and even gravitons. 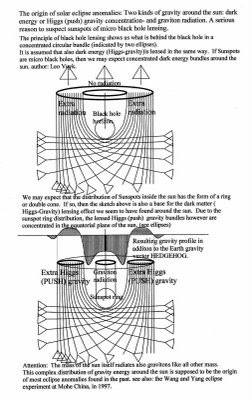 As a result a black hole has only incoming Higgs pressure at its horizon and the nucleus of the black hole is assumed to absorb the Higgs particles and the vacuum lattice at the same time. Space distortion is the result and even the change of speed of light. The edges of the lattice are elongated into the direction of the black hole and shortened perpendicular to it. Globular vector bundle hedgehog to shows the complexity of gravity. Double LE SAGE Gravity, originated by the combined scattering influence of Higgs pressure (3)(Casimir) and Graviton pressure (6) in the form of a vector Hedgehog. This vector Hedgehog is a basic element in the next explanation for well documented gravity anomalies. 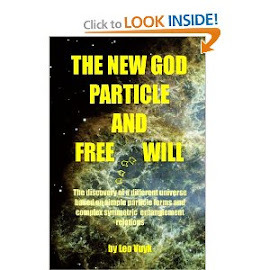 The total Higgs pressure from outside acting on a mass like the earth, is larger than the Higgs pressure coming from the inside of that mass, because inside the earth, many Higgs particles are assumed to have changed by collision with Fermions into Gravitons. 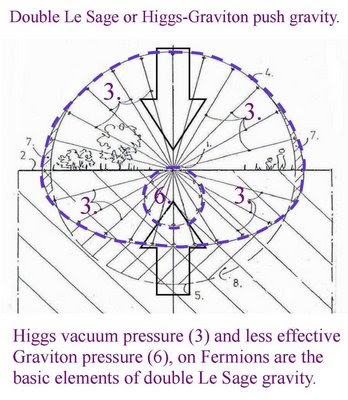 Gravitons are supposed to originate less scattering pressure on Fermions than Higgs particles. As a conequence, the double Le Sage gravity is supposed to be the result of the mutual scattering (push) influence of the oscillating local Higgs Field- together with the local Graviton scattering on Fermions. 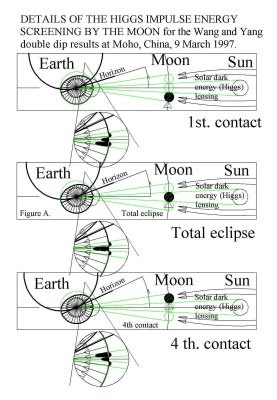 The complicated Solar gravity system seems to be responsible for three in principle different kinds of gravity eclipse variations found by scientists.